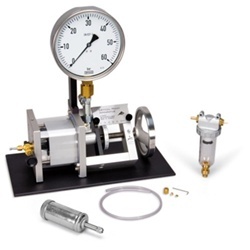 A high-precision device for studying the compression and liquefaction of a gas, determining the critical point and recording isotherms in p-V (Clapeyron) diagrams. The test gas is sulfur hexafluoride (SF6), which has a critical temperature of 318.6 K (45.5°C) and a critical pressure of 3.76 MPa (37.6 bars), allowing for a simple experiment set-up. 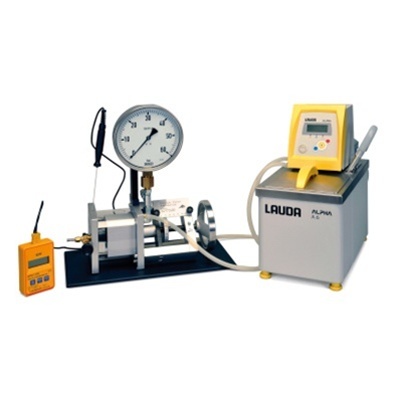 The apparatus includes a transparent measuring cell that is highly resistant to leakage and compression. The volume inside the cell is changed via a finely adjustable hand-wheel, the change being indicated by a combination of a fixed and a rotary scale to an accuracy of 1/1000 of the maximum volume. The pressure is generated by a hydraulic system containing castor oil of medically approved quality. The measuring cell and hydraulic system are separated by a cap seal which rolls in as the volume increases. This design means the pressure gradient between the measuring cell and oil chamber is negligible. A manometer measures gas pressure instead of oil pressure without taking up any dead space inside the measuring cell. During transitions from the gaseous to the liquid phases and vice versa, it is therefore possible to observe the formation of the first drops of liquid and disappearance of the last gas bubbles. The measuring cell is enclosed in a transparent water chamber. A circulation thermostat allows the temperature to be maintained at a highly constant value, which can be monitored by means of a thermometer. Practical indications of the volume, pressure and temperature permit easy recording of p-V or pV-p diagrams providing qualitatively correct results. 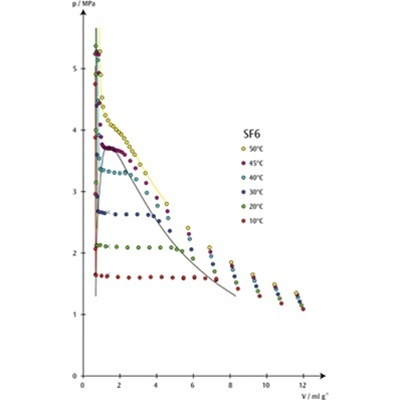 Pressure and temperature-dependent volumetric corrections also provide quantitatively accurate results comparing favorably with standard reference values. Bore for temperature sensor: 6 mm dia. Temperature control connections: 7 mm dia. Reducing valve connection: 1/8" dia. Standard gas connection: 3.5 mm dia. In accordance with good laboratory practice, it is advisable to obtain gas via a fixed pipeline if the critical point apparatus is used frequently. In case of occasional usage, it is more expedient to obtain the test gas from MINICAN® canisters. A MINICAN® gas connection is designed similarly to the valve on a common spray can, i.e. it is opened simply by fitting the MINICAN® on the gas connection nozzle. NiCr-Ni measurement sensor. Sensor not included in scope of supply. Temperature measurement sensor with stainless steel (V4A)-tube, spring-mounted (rigid) and silicone cable.